Two hours southwest of Hudson, on the New York-Pennsylvania line, lies one of the most remarkable bridges found anywhere. Somehow, I hadn't heard of the Delaware Aqueduct, the oldest wire suspension bridge in the United States, until a couple months ago. It was designed by John Augustus Roebling, the engineer of the Brooklyn Bridge. But as remarkable as the Brooklyn Bridge is, the Delaware Aqueduct might be more amazing. The aqueduct carries vehicular traffic today. The aqueduct was built in 1849 as an improvement to the earlier, 106-mile long Delaware-Hudson Canal. The privately financed canal had been completed in 1828 to carry coal from northeastern Pennsylvania to the Hudson River at Kingston, New York. Most of the coal apparently continued to New York City via the Hudson River, helping fuel the city's growth. I haven't yet grasped the canal's whole story (... e.g., why such a circuitous route to NYC?! ), but apparently boat traffic on the canal originally crossed the Delaware River via the river itself. I'm guessing the canal boats were lowered via locks, floated across the river, and raised again to continue on their way. In any event, the canal traffic had to negotiate commercial timbers being floated down the river, presenting not only an inconvenience but a danger. Hence, the Delaware Aqueduct was built to carry the canal and its boats over the river. The canal bed sat on the bottom chords of the cross trusses while the tow path sat on the top. Pictured at right is one of the cross trusses. The metal, inverted U-shaped stirrup near the lower left of the assembly was used to hang the truss from the main cable. Each stirrup was a different length to accommodate the drape of the cable. Eventually, the commercial viability of the canal was superseded by rail. The canal was abandoned and filled, and the aqueduct was decommissioned in 1898. The aqueduct was then purchased by a local businessman who removed the canal side walls and the upper tow paths (thus exposing the cables) and installed a vehicular roadway. He used his new bridge to transport timber from his forests in New York to the rail lines in Pennsylvania. He allowed the public to use the bridge for a fee, payable at a new toll house built on the New York side. Several generations of toll keepers lived in the house until the 1970s. 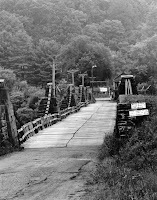 In 1980, the bridge was purchased by the National Park Service. A full restoration was undertaken, including reinforcement of the structural system (structural loads for water are uniform, while loads from moving vehicles are dynamic, something not considered in the earlier conversion). The canal sidewalls and the upper towpaths were rebuilt. The toll house at the New York side of the bridge was made into a modest, informative museum. The bridge doesn't get ﻿﻿﻿﻿﻿﻿﻿﻿﻿﻿﻿﻿﻿﻿﻿﻿﻿a lot of traffic. In the 45 minutes I was there, about six cars crossed. It's probably busier during vacation season. But driving and walking across it are unique experiences. The one lane roadway is tightly framed by the canal sidewalls, creating a tunnel effect for drivers. Crossing on foot, on the old tow paths, gives the pedestrian a bird's eye view of the river as well as the roadway 9 feet below. Here's a video showing what it's like to drive across the bridge. I'm hoping to visit it again soon... perhaps via a raft ride next time.